On 14 December 1935, the Chief Inspector of Armaments at the Woolwich Arsenal issued a formal invitation to interested parties to produce vehicles for military use to conform to various War Office (inexplicably abbreviated as WD) specifications. As a consequence, a copy arrived in the hands of Colonel N.O. Carr, (aka “no car”), Director of Mechanization and Artillery of the Canadian Army. Carr sailed to the UK to study the type of vehicles that were being built, especially those to WD specification, as the British intention was that vehicles would be standardised throughout the “British Commonwealth of Nations”. 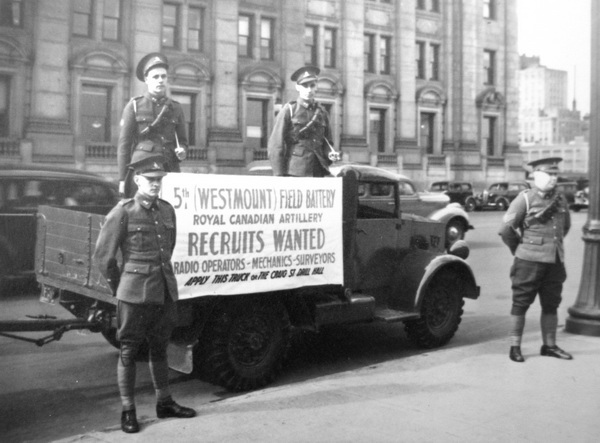 At the time, the Canadian Permanent Force (PF) had only increased from 3,700 to 4,261 all ranks between July 1931 and July 1939, with all three PF infantry units under strength. 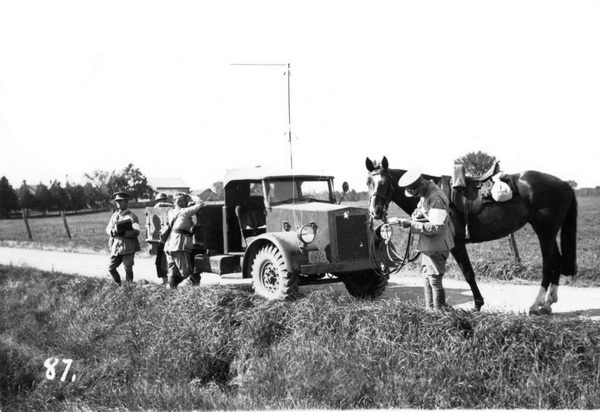 Although, by 1936, the British had begun to convert its horse-drawn transport to motor vehicles, the Canadians could boast only a small number of Ford and Chevrolet light trucks of various types, as well as a few commercial pattern cars used as staff or reconnaissance cars. 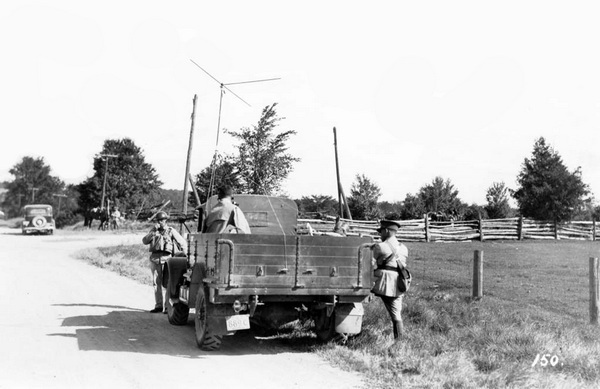 An early experiment in mechanization occurred in 1934, when Ford of Canada and General Motors of Canada were each invited to build an experimental armoured car, to undergo testing by the Permanent Force. The deal involved the government paying for the materials and chassis while the companies paid for the design work and assembly. In the end the government paid $2,500.00 compared to Ford and GM of Canada who each invested $9,000.00 in labour and engineering to build their respective cars. The Ford differed from the Chevrolet in that it had dual wheels on the second and third axles, a V-8 gasoline engine, and the armour plating was welded rather than riveted and bolted. 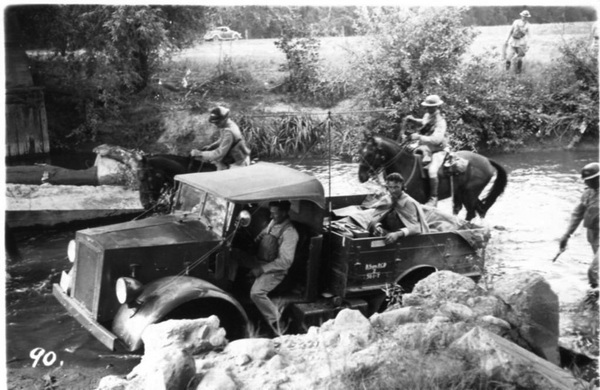 Both armoured cars had a maximum speed of 30mph, and the Ford was able to do eight mph in reverse. 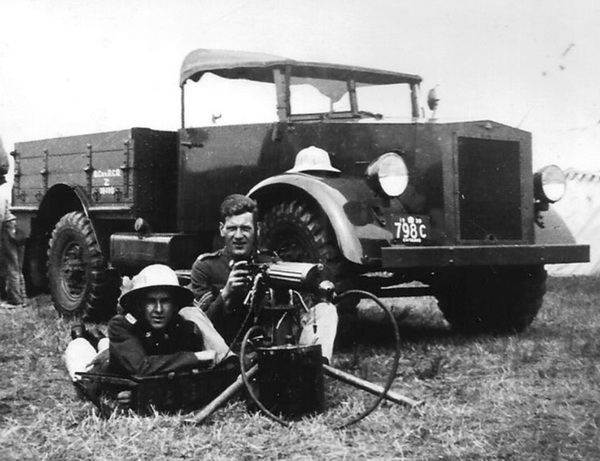 It was intended that each vehicle would be armed with the Vickers Mk. VI medium machine gun, but these were delayed as the feed mechanisms were on the wrong side, having been originally designed by the British for right hand drive vehicles. 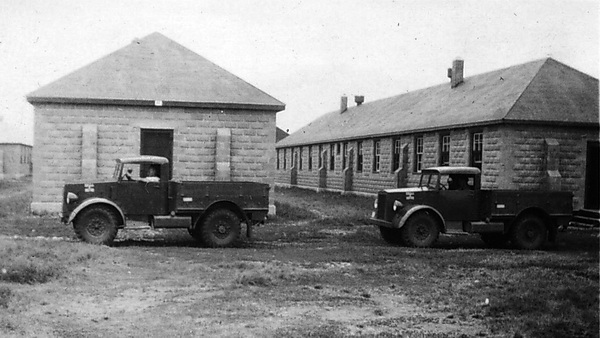 The cars underwent testing at Camp Petawawa, Ontario with the Royal Canadian Dragoons where both performed satisfactorily. The ten-wheel Ford performed best in off-road tests and the six-wheel Chevrolet excelled on roads. Orders for further cars failed to materialise because of budgetary limitations. The decision reached at the conclusion of these meetings was that production in Canada of short wheelbase vehicles was to conform to WD Specifications, and to use a maximum of standard components. For the present, only the 15-hundredweight (15-cwt, or 3/4-ton), four-wheel,98-inch wheelbase was under consideration. DND stressed that their intent was that a military 15-cwt pilot model be developed by both Chevrolet and Ford, using the existing commercial chassis and that the two pilots be developed in parallel. Just days later, General Motors of Canada General Manager H.J. Carmichael, and W.R. Campbell, President of Ford of Canada, met with Master-General of the Ordnance, Major-General Caldwell. Campbell and Carmichael agreed to co-operate with the DND in regard to the development of War Office pattern, short wheelbase vehicles, and agreed to pool resources to achieve this with minimum capital outlay. Both executives took the opportunity to remind DND that they had previously expended a significant amount of money in developing the armoured car, and it was hoped that DND was not seeking co-operation on the same financial basis. That said, Carmichael said they could provide a 98-in 4-wheel pilot model at cost, and Campbell said he might be willing to co-operate on the same basis. They also hoped that purchases of vehicles would be split equally between the companies. In February 1937, both automakers met and discussed possible modifications to Ford and Chevrolet standard commercial chassis to meet the WD specification. GM had already completed drawings showing proposed modifications to the Chevrolet chassis. Briefly, the GM proposal provided for moving the front axle assembly to the rear, moving the driving controls and steering gear forward, and moving the rear axle forward. These changes resulted in providing a wheelbase of 106 inches with a distance from the back of the driver’s seat to the centre of the back axle of 51½ inches. Specified loading space was thus provided to allow for fitting of standard WD pattern bodies. On the other hand, Ford had encountered difficulties and had made little progress with their design. Because of the transverse spring assembly on their front axle, it was impossible to move the axle to the rear as was proposed for the Chevrolet chassis. Moving the driving controls forward presented difficulties owing to the width of the engine. The rear axle, however, could be moved forward 19 inches, leaving a wheelbase of 112½ inches with the specified loading space behind the driver’s seat. Slight adjustment of the driving controls might allow a further shortening of three or four inches, although further adjustment would be possible only by altering the front springs to the semi-elliptic type. The Ford pilot was built in a new 50 x 100 feet bay, dubbed the “Pilot Bay” which Ford had set up in the basement of its Windsor plant. A wheelbase of 108½ inches, together with Ford’s proposed arrangement of controls, seat, front fender, and engine and hood were acceptable. A collapsible canvas hood was required. Monroe shock absorbers would be accepted for trial. Front wheels were not to be fitted with chain lugs. Ford would supply a load-carrying body with the pilot model truck in accordance with drawings and specifications. A full-width, fixed windscreen without provision for opening would be acceptable. The glass could be in one or two sections. The width of the rear track should be as close to that of the front as possible and therefore delaying delivery of the special 14-in. brake drums until 17 May was acceptable as it would enable a 62-inch rear track. Attachment of Lovejoy shock absorbers was acceptable. No spare tyre was to be carried. DND would send drawings and specifications of a load-carrying body, and Oshawa would supply the body for the pilot truck. A fixed top of sheet steel and tubular frame construction was acceptable, provided it was satisfactory and inexpensive; otherwise a collapsible canvas top would be used. The steel top should be able to withstand the stresses of cross-country travel. A full-width fixed windscreen without provision for opening was acceptable, in either one or two sections. If the fixed top and windscreen could be detached from the chassis to reduce overall height when shipping, then this would be an advantage, if it did not unduly complicate the design. Ford suggested that the bodies for the two pilot models should be made by the same source in view of the desired standardisation of bodies. Ford had been asked to withhold ordering their body until they received the drawings from Ottawa and further instructions. 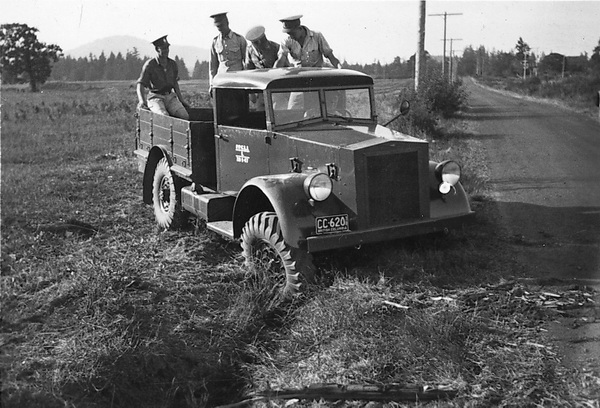 These trucks are plated in British Columbia and are dated 1940. The trucks are believed to be transporting soldiers of the Westminster Regiment. Photo courtesy Colin Stevens. The body manufacturer chosen was Canada Carriage & Body Company Limited, of Brantford, Ontario, who informed DND that ash was very difficult to obtain in Canada and that which was obtainable was of non-uniform quality. As an alternative, they suggested oak and this recommendation was accepted by DND. While the body was being built, it became clear that GM would have to request changes in the specifications in order to fit their chassis. A 36-inch outside width of the main sills was required to suit the Chevrolet chassis frame, and a 75¼-inch outside width to suit the overall width of the tyres. By the end of May 1937, neither pilot model had been completed. There were, in fact, outstanding design problems to be sorted out. 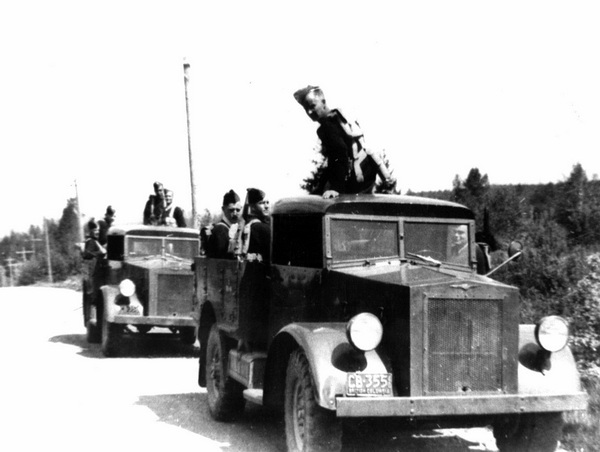 DND inspected the GM pilot truck on 16 June 1937. The major components, with the exception of the front hub assemblies and the body, were complete and partially assembled. The front hubs and body were expected to be available that week. There still remained considerable work on minor details and fittings, which was estimated to take another two weeks. Delivery was expected therefore about 10 July. The truck appeared to be well designed and constructed. Minor criticisms were made and rectification was promised. These points included connections to front shock absorbers, spacing of foot controls, battery box, and the rear window in the cab. Both pilots were finally ready in August. At the request of DND they were commercially licenced and the manufacturers were asked to drive them from the respective plants to Ottawa. The GM truck was delivered and viewed by the Chief of the General Staff and then driven by a Staff Officer to Camp Petawawa for acceptance trials. The Ford was delayed and permission was given for this vehicle to be driven directly to Petawawa. Once delivered, the trucks were given DND numbers 37-1-1 for the Ford and 37-1-2 for the GM. Instructions issued by DND later required that vehicle numbers be painted on the doors, although this was not always followed. During the trials, each truck accumulated approximately 1,000 miles of road and cross-country driving. Considering that the two trucks were, in effect, new models and had been put together in a matter of seven months, the faults identified by DND tended to be relatively minor. 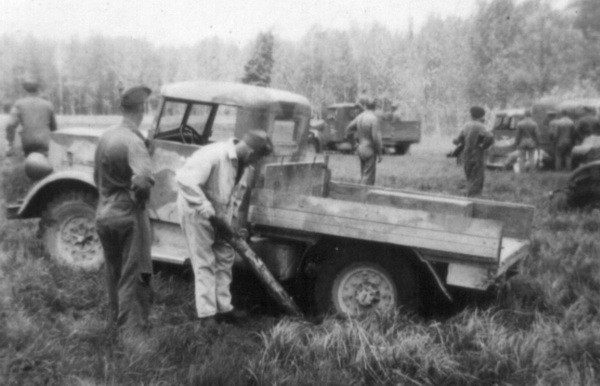 The Ford’s weak point was its steering, which had too much play, while the GM vehicle suffered from weak springs. There were no recorded damages, breakages, or involuntary stops during the trials. DND concluded that the vehicles were generally satisfactory in respect of design, performance, and ability to stand rough usage. However, certain minor modifications were required for subsequent production. It was considered that the designs of both the Chevrolet and Ford 15-cwt trucks would be stable, and that a firm specification to govern future supply would be completed by 1 October 1937. DND intended to order 70 of the 15-cwt trucks that financial year. This quantity would meet provisional establishments of the Permanent Force. A list was compiled of all existing 15-cwt trucks, or equivalents, which were to be replaced by new trucks, traded-in, or retained for instructional purposes. The oldest was a 1928 Durant Coach. The DND fleet also included a 1929 Chevrolet LQ stake truck, a 1934 Chevrolet light delivery van, two Chevrolet pickups, and a 1½-ton stake truck, all 1934 Models. There were eight Crossley Staff Cars to be sent to schools. All others were Ford 1931 to 1936 Model 2-ton stake trucks, station wagons or Phaetons. 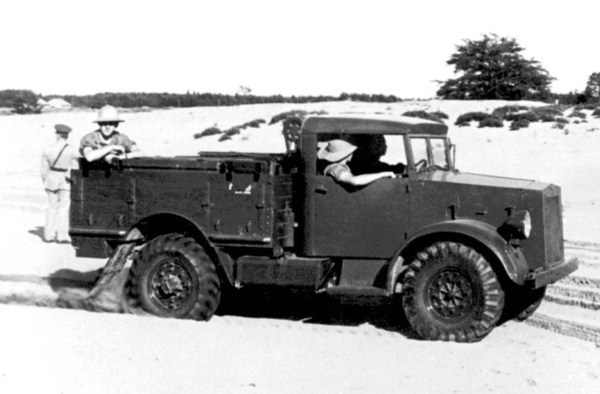 Ten 1936 Ford 2-ton trucks were to be retained, to be supplemented by the new 15-cwt trucks. It was estimated that 36 new GM and 36 Ford trucks were required. This represented 35 new trucks from each firm plus the two pilots. In a cash-strapped government weathering the Great Depression, DND was told that the quantity was excessive and to re-assess its needs. In accordance with government direction, the Permanent Force requirements were revised and a quantity of 51 new production trucks was put forward for approval as the bare minimum. On 14 January 1938, the Director of Contracts at DND formally wrote to Ford Canada and GM of Canada requesting quotations from each of them for 15-cwt trucks. Of these, Ford was to quote for 25 trucks and GM for 26. 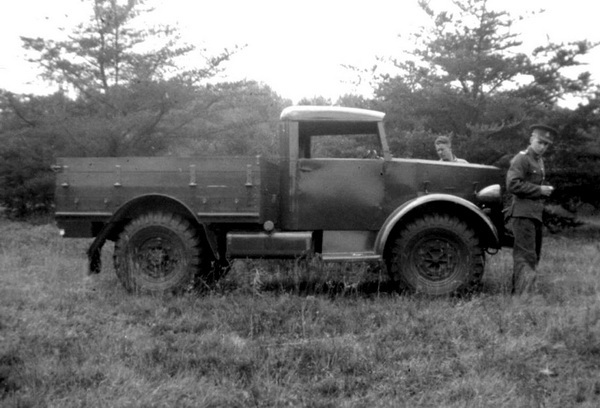 Surprisingly, Ford officially declined the invitation to bid, as they were not able to produce them to the required price.However, given Ford’s need to use a modified 101-inch forward-control chassis, which was not even going to start production until the early spring of 1938, and because even then the front axle to be used could not cope with the requisite 16-inch wheels, it was arguably impossible for Ford of Canada to have tendered in any event, unless DND was prepared to pay the considerable costs of tooling-up for special 14-inch brake drums. With no other option, DND invited GM of Canada to tender for the supply of all 51 vehicles. In practice, the trucks were ordered in two linked contracts, the first for 35 trucks, at a price of C$102,590.47 and a further order for 16 trucks at a price of C$46,158.81, to include a 10% fixed profit in each case. 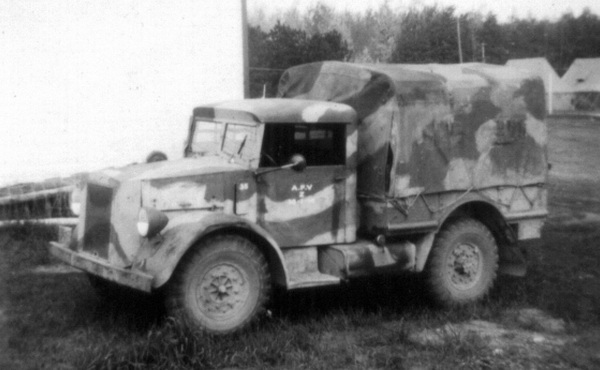 Trucks destined for simple cargo duties were to be equipped with a canvas cover, while this was dispensed with for trucks that were to act as tractors for anti-tank artillery. Existing trucks that were not traded-in, or that continued to be used, were limited to instructional purposes only, and were not to be driven. This was intended to train the units concerned in mechanisation. In keeping with DND practice, each truck was allotted a DND number, starting with 38-1-2 and continuing to 38-1-52. The numbering used at the time consisted of the year of contract (1938), followed by the single digit (1, which doesn’t appear to have any relevance as every DND vehicle shares this same number), and then the sequential number of the vehicle obtained under the contract. In late 1939, following British Army practice, the DND number (also termed the “census” number) was prefixed with the letter “Z”, i.e. Z38-1-46. The factory serial numbers were 815312801 to 815312835 for the first purchase and 815314928 to 815314943 for the second. The GM numbering system can be read as the model year (8), followed by the model number (1531), and then the sequential production number for the model. Even though Ford declined to bid on the contract, the process proved that two competing industrial giants could set aside their corporate differences in order to work together in the national interest. 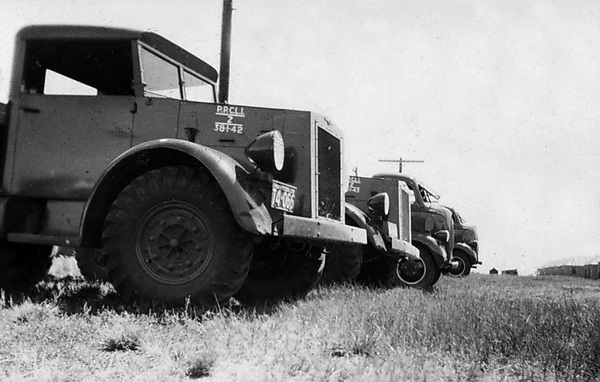 The development and subsequent purchase of these 15cwt General Service trucks provided a solid basis for cooperation and interchangeability of parts and assemblies between GM and Ford. Thanks to this foundation, Canada was well placed to assume a significant role during the Second World War as a major supplier of wheeled military vehicles – known around the world as the Canadian Military Pattern. The author wishes to acknowledge the work undertaken by the late David Hayward whose unpublished work was often consulted in the preparation of this article. Lots of informations on pre-war army…..keep going.